Journeying to the tombs of imams in Iraq's shrine cities is a time-honored Shiite practice that has recently emerged from a long hiatus. For most of the twentieth century, a variety of political circumstances kept the holy sites of Iraq out of reach for most Shiites. Iranian governments have had a long history of involvement with Iraq's Shiite shrines. Successive Shiite dynasties in Iran donated extensively to them, helping to build the architectural structures themselves as well as related infrastructure. Then as now, promoting the pilgrimage was a way for Iranian rulers to portray themselves as upholders of Shiite Islam—the country's official religion since the sixteenth century. The pilgrimage was disrupted for most of the twentieth century by feuding regimes in Tehran and Baghdad, which gives its recent revival special significance. Following World War I, Reza Shah Pahlavi rose to power in Iran and sought to modernize the country by promoting secular nationalism. He also endeavored to uproot customs seen as backward or superstitious, which to his mind included the pilgrimage to ancient tombs in neighboring Iraq. Reza Shah's government instituted a series of measures that drastically cut the number of pilgrims and kept it low for decades. After his son Mohammed Reza Pahlavi was overthrown and replaced by the Islamic Republic in 1979, a new obstacle to the pilgrimage arose in the form of Iraqi dictator Saddam Hussein, who invaded Iran, ending bilateral religious ties and instituting harsh measures against Iraqi Shiites, including tight pilgrimage restrictions. Saddam's toppling in 2003 paved the way for a restoration of the pilgrimage tradition to Iraq. The return of Iranian pilgrims was a long-awaited event, rich with political and religious symbolism. For the Iranian government, which made the liberation of Karbala a propaganda motif during the Iran-Iraq war, the revived pilgrimage represented the triumph of Shiite Islam over secular, Westernizing rulers. Organizing and promoting the travel of Iranian pilgrims to Iraq is a way for Tehran to celebrate what it portrays as an Islamic victory. At the same time, promoting the pilgrimage also continues a centuries old tradition of Iranian state patronage of Iraq's Shiite shrines. A mere nine months after Saddam's fall, visitors to Najaf in December 2003 noticed a strong presence of foreign pilgrims, most of them Iranian. After an initial period of chaotic, ad-hoc pilgrimage, Tehran decided to assume a key role in promoting it and arranging pilgrims' affairs. In April 2005, just three months after Iraq's first post-Saddam elections, Iranian and Iraqi diplomats signed an agreement allowing 1,500 Iranian pilgrims to enter Iraq daily. By 2009, the quota for Iranian pilgrims had reached 5,000 a day and was further increased to 6,000 a day in 2011. Tehran quickly took measures to organize and control the activities of Iranian pilgrims inside Iraq. July 2005 saw the formation of the quasi-governmental All-Iran Central Company of Pilgrimage Service Providers (Sharekat Markazi-ye Dafater-e Khadamat-e Zeyarati-e Sarasar-e Iran, SHAMSA) to provide Iranian pilgrims with packaged tours and to negotiate deals with Iraqi businesses to provide lodging, transportation, and security. Although SHAMSA is registered as a private corporation, all of its business dealings in Iraq and Iran are submitted for approval to an Iranian government body called the Hajj and Pilgrimage Organization (Sazeman-e Hajj va Zeyarat). This agency also sets the prices SHAMSA charges for its package tours and oversees the application process for tourists and guides. Some American observers have suggested that the Iranian government is using its control over the journey to exert economic and political influence ("soft power") inside Iraq. Many Iraqis share this opinion although the belief seems to be based more on deep-seated suspicions than on hard evidence. Locals in Karbala believed rumors that Iranians were buying up real estate in the city as part of a planned takeover, allegedly using local front men to circumvent Iraqi laws that restrict the purchase of real estate by foreigners. One Iraqi journalist even described the sale of Iranian-style women's clothing in Karbala's markets as evidence of growing Iranian hegemony. Whatever influence Tehran is thought to have obtained through the pilgrimage would seem to be counter-balanced by the paranoid fears and resentments the Iranian presence has provoked among Iraqis. Gaining influence in Iraq, however, does not seem to be a high priority for the architects of Iran's pilgrimage policy. An examination of SHAMSA's record suggests the quasi-governmental tour company is dedicated to ensuring a comfortable stay for Iranian pilgrims even when this requires taking measures that displease Iraqi hosts. SHAMSA has provoked resentment among Iraqi businessmen through its monopolistic practices, which include forcing Iraqi hotel owners to offer special low rates to its tour groups. In 2009, SHAMSA opened a number of central kitchens in Karbala where meals are cooked by Iranian staff and delivered twice daily to the pilgrims' hotels, depriving Iraqi restaurants of Iranian pilgrims' business. When asked about these kitchens by an Iraqi journalist, a SHAMSA representative explained that Iranians needed specially prepared meals because Iraqi restaurants "are not careful when it comes to standards of hygiene." The pilgrimage brings millions of Iranians to Iraq every year, but the Iranian government makes little effort to use its citizens as goodwill ambassadors or agents of influence. SHAMSA's security department advises pilgrims to avoid discussing politics with Iraqis and warns them not to accept any gifts of food, drink, or perfume offered to them by locals. These instructions explicitly include nudhour, pilgrim offerings, which are a long-standing custom in the folk religion of southern Iraq. Bread, sweets, tea, and even cigarettes are proffered as part of the nudhour vow intended to secure specific divine blessings, such as finding a spouse or recovering from an illness. (The term is also used to describe other types of vow-offerings, including cash donations made for the upkeep of the shrines.) Refusing gifts from strangers may be a sensible precaution for Iranian pilgrims but may easily offend well-meaning Iraqi donors. Despite this, SHAMSA's security procedures prevail, which would seem to reflect Tehran's indifference to using the pilgrimage to win friends and influence in Iraq. On the other hand, the pilgrimage is an important tool in the arena of domestic political propaganda. By promoting the pilgrimage to Iraq, the Iranian government expresses its ideological commitment to fostering Shiite religious practice among Iran's citizens. Publicly demonstrating this commitment bolsters its oft-questioned domestic legitimacy. Equally important, Tehran's role in sponsoring the pilgrimage gives it some measure of control over how Iranian Shiites experience Iraq's shrines: All SHAMSA tour groups are accompanied by government-selected spiritual guides, who are vetted for political awareness and loyalty to the Islamic regime. The philosophy behind the Islamic Republican regime is faith-based, and the regime cannot appear apathetic [to the pilgrimage] … The only way to preserve the regime is to keep the people on a spiritual path. How else could we keep the people going along with the regime? This high regard assigned to the pilgrimage's domestic political impact by Iranian officials may explain their apparent neglect of its potential as an avenue for influence over neighboring Iraq. This can also be seen in the manner in which the Iranian state oversees the trip at the highest levels of the government. On paper, the Hajj and Pilgrimage Organization is a branch of Iran's Ministry of Culture and Islamic Guidance; in practice, Iran's supreme leader Ayatollah Ali Khamene'i maintains a permanent liaison to the agency and exercises veto power over all its decisions. The supreme leader's liaison office also selects and trains Shiite clerics who accompany every SHAMSA tour group as spiritual guides. Among other conditions, candidates for the guide position must pass a test of their "political knowledge" and must demonstrate their obedience to the principle of "absolute clerical political rule." The influence of Najaf-based Shiite cleric Ayatollah Ali Sistani over Iranian Shiites is a most troubling problem for the mullahs in Tehran. Sistani's political independence and growing popularity among Iranian Shiites is viewed as a serious challenge to the legitimacy of Iran's state-sponsored religious establishment. In April 2009, Iranian president Mahmoud Ahmadinejad ordered a number of administrative changes in the Hajj and Pilgrimage Organization but reversed course after receiving a public rebuke from Khamene'i, who called the president's move "inappropriate." The public disagreement between Iran's two most powerful public figures indicates that deep political sensitivities surround the pilgrimage to Iraq. Despite the attention given to these matters by the office of the supreme leader, the government's efforts to co-opt the pilgrimage face serious competition from a rival force: an independent, Iraqi-based Shiite religious leadership that refuses to recognize the religious authority of Tehran's rulers but which is increasingly popular inside Iran. Rather than strengthening Iranian influence over Iraqi affairs, the pilgrimage seems to be enhancing the popularity of Iraq-based religious leaders inside Iran. This popularity will likely be a source of concern for the Iranian government in the years to come. The most influential of these leaders is Grand Ayatollah Ali Sistani. Though born in Iran, the 83-year-old Sistani has spent most of his life in Iraq, studying and teaching in the shrine city of Najaf. Sistani enjoys an undisputed position as the most respected Shiite religious leader in Iraq, his popularity due in large part to his reputation for independence and integrity. His steadfast support for elections played a critical role in Iraq's post-Saddam democratic transition, but at the same time, he has been careful to avoid association with any political faction. Unlike many Iranian religious leaders, Sistani receives no government stipend. Sistani's popularity extends into Iran where it has deepened in recent years, partly due to the pilgrimage. The Iranian-American scholar Mehdi Khalaji cites estimates that "nearly 80 percent of Shiite worshippers" in Iran "follow Ayatollah Ali Sistani" as their spiritual leader. This is echoed by Johns Hopkins' Vali Nasr who attributes Sistani's rising popularity to two factors: the influence of pilgrims returning from Iraq, and widespread cynicism toward Tehran's corrupt religious establishment. Since the 1979 Islamic revolution, the Iranian mullahs have transformed themselves from humble scholars into an elite that controls the country's political and economic life. Sistani's popularity reflects a genuine hunger in Iran for an independent religious leadership untainted by connections and corruption. While Sistani holds no formal political office, his authority over Iraq's Shiite shrines is recognized by the Baghdad government and is formalized by law 19 (the awkwardly named "Administration of the Holy Shrines and the Noble Shiite Pilgrimage Sites Law"). Passed by the Iraqi parliament in 2005, it directs the minister of Islamic endowments to appoint directors for each of Iraq's shrines from among "qualified individuals of integrity who possess a good reputation and who have been approved by the supreme religious authority (marja)—being the religious scholar from among the scholars of Najaf whose authority is accepted by the majority of Shiites in Iraq." The custodians appointed by Ayatollah Sistani maintain tight control over the pilgrimage observances in Iraq's shrine cities. For example, before the January 2012 Arbaeen pilgrimage commemorating the martyrdom of Muhammad's grandson Hussein bin Ali, the management of the Imam Hussein shrine in Karbala issued a very detailed set of instructions covering matters of safety, hygiene, and security, as well as ritual guidelines. The governor of Karbala province also affirmed the exclusive authority of Sistani's followers to regulate and administer pilgrims' activities in and around the holy place. Sistani's disciples are thus provided with a platform to deliver their religious message, which eschews the fiery political rhetoric favored by Tehran's religious establishment. These views are disseminated through traditional Friday sermons at the shrines and, since the fall of Saddam Hussein, through modern media outlets as well. Every month, the Imam Ali shrine at Najaf issues a glossy Arabic magazine called al-Wilaya. 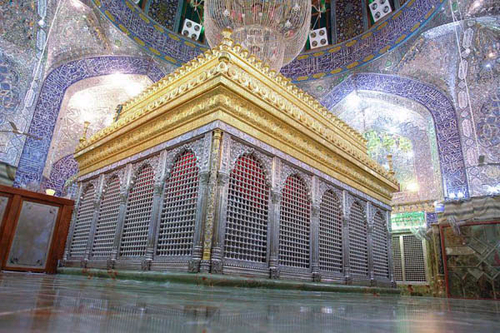 The Kazimiyah shrine in Baghdad publishes no fewer than three magazines while the Imam Hussein shrine in Karbala has its own satellite TV channel, which began broadcasting in 2009. The religious discourse promoted by Sistani's acolytes is devotional, not political. Their publications extol traditional religious values of piety, learning, and self-improvement while eschewing the politicized rhetoric of Iran's state-sponsored religious institutions. One searches these publications in vain for references to America as "the global arrogance" or to political opponents as "spreaders of corruption on earth." There is no talk of Western or "Zionist" conspiracies against Islam. The sermons given at the shrines during Friday prayers reflect this same pietistic outlook. When the preachers discuss politics, they do so in very general terms, calling for national unity and speaking about the Iraqi people's desire for development. They refrain from endorsing specific political parties, from issuing fiery condemnations of the United States, or from discussing the politics of neighboring Iran. At the same time, while the Shiite scholars of Najaf do not share the Iranian government's radical ideology, neither Sistani nor any other Iraqi ayatollah calls for a revolution in Iran. Even at the height of Iran's 2009 election crisis, Sistani and the other Iraq-based ayatollahs kept silent, refusing to endorse either the protesters or the government, carefully avoid meddling in neighboring politics. The position of Iraq's Shiite religious establishment reflects the traditional "quietist" school of Shiite thought, in which religious leaders can offer advice on political matters but do not take sides in the struggle for power. Adopting this approach, Sistani's followers in Iran can accept Khamene'i as a medieval-style king or sultan, deserving of obedience inasmuch as he maintains order and defends the country from external threats but devoid of religious authority. While Sistani's followers are not active supporters of the Iranian opposition, the existence of a popular and revered religious leadership outside of state control presents a serious challenge to Tehran's theocratic government. The ideology underlying Iran's Islamic Republic holds that religion and politics are inseparable. Iran's rulers insist that opposing the regime is the same as opposing Islam. To drive this point home, the Iranian government puts its domestic enemies on trial not for treason but for the crime of "waging war against God" (moharebeh). To make these claims convincing, the Islamic Republic needs more than the passive acquiescence of religious leaders; it needs their active endorsement of the regime's claims. This, however, is something that neither Sistani nor any of Iraq's Shiite religious leaders have been willing to give. In the aftermath of the 2009 post-election crackdown, a number of religious leaders inside Iran began voicing their displeasure with Khamene'i's policies. The regime responded by attacking these clerics' houses and offices, censoring their Internet sites, and in the case of the prominent cleric Ayatollah Yusof Sanei, having a pro-regime religious body deny his religious credentials. But the unintended consequences of this crackdown may only add to Iraq's prestige as a more independent and more legitimate center of Shiite Islam. The refusal of Iraqi clerics to endorse political repression in Iran may also serve to embolden religious opponents of Tehran's current regime. In the coming years, Iran's ruling elite will likely take measures designed to either co-opt or subvert the Shiite religious leadership based in Iraq's shrine cities. A hint of what these measures might look like was provided recently when Ayatollah Mahmoud Hashemi-Shahroudi, the former head of Iran's judiciary and a close ally of Khamene'i, opened an office in Najaf. It was rumored that Shahroudi, who was born in Iraq in 1949 to parents of Iranian descent, would soon return to Iraq to serve as a counterweight to Sistani. These rumors received negative coverage in Iraqi news media, and Shahrudi's office denied he was planning to move back to Iraq. Meanwhile, Iran's semi-official Fars News Agency blamed the Shahrudi controversy on "Zionist-Wahhabi media in Iraq and the region," which it said were "trying to create divisions between Iraqi and Iranian Shiites." Iraq's premier Nuri al-Maliki (l) meets with Mahmud Shahrudi in Iran, April 2012. Shahroudi, the former head of Iran's judiciary and Khamene'i's close ally, opened an office in Najaf, Iraq, in 2011. It was rumored that Shahroudi was there to serve as a counterweight to Ali Sistani's influence. The Shahrudi affair has apparently affected political relations between the two countries. During a visit to Iran in April 2013, Iraqi prime minister Nuri al-Maliki was photographed meeting with Shahrudi. 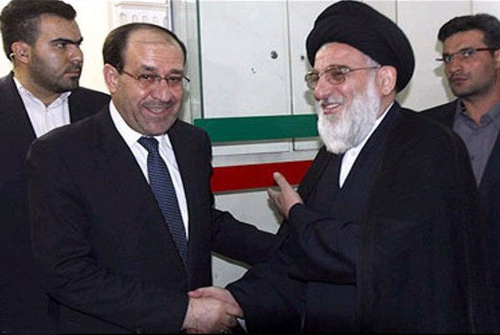 During the same visit, Maliki also met with Iran's deputy president Mohammed Reza Rahimi, who welcomed him by wishing for a "perfect union" between Iran and Iraq. The crudeness of this messaging provoked criticism in Iraq, forcing Maliki's allies to issue clarifications. At the same time, emphasizing close political ties with Iraq may be a way for Tehran to distract the Iranian public's attention from the intra-Shiite rivalry, providing another example of how domestic religious concerns shape Iranian policy. With its efforts to promote Ayatollah Shahrudi stalled, Iran may instead focus on co-opting or undermining the Najaf hawzah (religious academy), Iraq's most important religious institution. The hawzah is a loosely organized academy, which operates through time-honored but unwritten guidelines. There are no professional administrators, written exams, or formal budgets; the academy operates through private donations and personal relationships between teacher and student. This decentralized system has insulated it from political influences for centuries, but there are those who argue that the academy should be reformed and modernized. Any formalization of the hawzah system could make it more open to political influence, especially from Iran's Islamic Republic, a fact which has not gone unnoted by Iraqi observers. Ayatollah Sistani is presently the most respected figure in the Najaf hawzah, his position the result of his personal reputation, not any formal process. He and other Najaf-based scholars oversee large charitable and educational projects, paid for by private fundraising but which could be vulnerable to competition and co-option from Iran. Already, Khamene'i's office distributes stipends to students at the Najaf hawzah, supplementing but also competing with stipends offered by Sistani and other Iraqis. 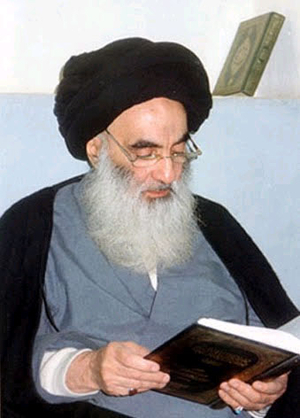 Sistani is currently in his eighties. When he dies, Iran may use its influence to back a particular candidate to succeed him or to prevent the emergence of any clear successor. However, such efforts will likely face determined opposition from Iraqi Shiites and from the many Iranian Shiites who now look to Iraq for religious guidance. If the Iranian government fails to co-opt or undermine Iraq's religious leadership, it may try instead to exert tighter control over the pilgrimage itself as a means of blocking any destabilizing religious influence from Iraq. Iranian authorities already ban non-SHAMSA pilgrims from crossing into Iraq by land, ostensibly for security reasons, although pilgrims who reject the official group tours can still book flights into Iraq. Iran's minister of culture and Islamic guidance, Mohammed Hosseini, recently encouraged prospective pilgrims to join official group tours, which he described as "materially and spiritually more suitable" to their needs. Future crackdowns on independent pilgrims or measures to tighten further political control of SHAMSA tours may provide indications of growing distress within the Iranian government about the pilgrimage's potentially subversive political influence. However, Tehran will have to act with caution. The adoption of repressive measures against Shiite pilgrims could be another nail in the coffin of the Islamic Republic's domestic legitimacy. The reemergence of Iraq as a Shiite religious center requires a reevaluation of the Iran-Iraq relationship. Tehran may exercise numerous forms of influence over its smaller, weaker, and poorer neighbor, but when it comes to religious affairs, the influence seems to be running mostly in the opposite direction. In the coming years, Iranian authorities may be forced to devote their attention to counteracting Iraqi religious influence inside their country. The pilgrimage is a major avenue for this influence, which makes control of the pilgrimage a vital interest for the government in Tehran. The contest between Iran's theocracy and Iraq's Shiite religious scholars is asymmetrical and highly volatile. Tehran enjoys vast economic and political resources and has a record of cunning and ruthless responses to perceived threats. Ayatollah Sistani and the Najaf hawzah have none of these advantages, but they do have a strong and growing base of popular support inside Iran. Neither side seems eager for a direct confrontation, which would have dangerous and unpredictable consequences for all involved. It is too early to tell how this contest will end. Perhaps Tehran will neutralize Iraq's independent religious establishment, buying the Islamic Republic a renewed lease on life until the next crisis comes along. Alternatively, the rebirth of Najaf as a world center of Shiism may deprive Iran's present rulers of their religious pretensions, paving the way for the end to the regime's Islamist system. But with close to two million Iranian pilgrims visiting Iraq each year, an amicable divorce between these two rival interpretations of Shiism seems unlikely. Until one side or the other prevails, the religious dimension will play an important role in Iranian-Iraqi relations. Observers of these affairs should pay close attention to the pilgrimage, which may in fact be the single most important bilateral tie between the two countries. For policymakers, the pilgrimage is an important reminder that, even with all eyes turned on Iran, events in Iraq may continue to play a pivotal role in the region's future. Nathaniel Rabkin is the managing editor of Inside Iraqi Politics and a graduate student in Middle East history at the University of Haifa. Hajj News website, Tehran, Mar. 15, 2011. "The number of pilgrims for the Years from 1416H. (1995G.) to 1431H. (2010G)," Central Department of Statistics and Information, Kingdom of Saudi Arabia, Riyadh, accessed Aug. 27. 2013. Tourism in Israel: 1990-2009, Israel Central Bureau of Statistics, Jerusalem, 2011, pp. 1-3. Encyclopaedia of Islam, 2nd. edition (Leiden: E.J. Brill, 1960-2005), s.v. 'Atabat. Yitzhak Nakash, The Shi'is of Iraq (Princeton: Princeton University Press, 2003), pp. 170-1. The Washington Post, Dec. 10, 2003. Asharq al-Awsat (London), Apr. 17, 2005. Islamic Republic of Iran Broadcasting, Arabic World Service, June 16, 2011. Sharekat-e Markazi-ye Dafater-e Khadamat-e Sarasar-e Iran website, accessed June 25, 2012. The New York Times, May 30, 2009; Marissa Cochrane-Sullivan, "Iran's Soft Power in Iraq," Iran Tracker, American Enterprise Institute, Washington, D.C., Aug. 4, 2009. The National (Abu Dhabi), June 1, 2009. Niqash (Berlin), Nov. 15, 2011; al-Sumaria TV News (Baghdad), Apr. 19, 2011. Asharq al-Awsat, Oct. 12, 2009; al-Mada (Baghdad), Jan. 23, 2011. Zeyarat (Tehran), no.1, Oct./Nov. 2008 (Abanmah 1387 Anno Persico), p. 22. Salman Hadi Toameh, Karbala Fiad-Dhakira (Baghdad: publisher unknown, 1988), pp. 241-52. Zeyarat, Oct./Nov. 2008, p. 22. Ministry of Culture and Islamic Guidance website, accessed Sept. 3, 2013. Fars News Agency (Tehran), Jan. 23, 2012. Be'ese-ye Magham-e Moazzam-e Rahbari, Moavenat-e Omur-e Ruhaniyun, Sept. 3, 2013. The New York Times, May 4, 2009. Mehdi Khalaji, The Last Marja (Washington, D.C.: Washington Institute for Near East Policy, 2006), p. 7. Vali Nasr, The Shia Revival (New York: W.W. Norton, 2007), p. 221. Asghar Schirazi, The Constitution of Iran (London: I.B. Tauris, 1997), pp. 150-5. Law 19,art. 4, Iraq Local Governance Law Library, 2005. Ta'alimat Khassah lil-Mawakib Fi Dhikra Ziyarat al-Arbain al-Khalida, Imam Hussein shrine, Karbala, Jan. 2, 2012. Imam Hussein shrine website, Jan. 20, 2011. Imam Ali shrine website, accessed May 16, 2012. Kazimiya shrine website, accessed May 16, 2012. Karbala TV, accessed June 25, 2012. Mehdi Khalaji, "The Iranian Clergy's Silence," Current Trends in Islamist Ideology, July 12, 2010. The New York Times, Feb. 1, 2010; "Iran: Stop Imminent Execution of Kurdish Dissident," Human Rights Watch, Washington, D.C., June 29, 2010; Radio Free Europe, Aug. 19, 2010. The Christian Science Monitor (Boston), June 1, 2010; on religious opposition in Iran, see, also, Said Amir Arjomand, "The Iranian Revolution in the New Era," Current Trends in Islamist Ideology, Aug. 3, 2010. Asharq al-Awsat, Nov. 26, 2011. Al-Sumaria TV news, Nov. 16, 2011; Niqash, June 28, 2012. Fars News Agency, Dec. 18, 2011. Al-Sumaria TV News, Apr. 24, 2012. Ibid., Apr. 24, 2012; al-Arab (Doha), Apr. 26, 2012. Khaled Hantoush, "Hawzat an-Najaf: Nadhra Min ad-Dakhil," Masarat (Baghdad), v. 6, no. 15, pp. 101-16. Khalaji, The Last Marja, p. 32. Islamic Republic News Agency (IRNA, Tehran), reprinted on the Tehran branch website of the Haj and Pilgrimage Organization, May 11, 2013, accessed Oct.19, 2012. Fars News Agency, Mar. 4, 2013. Related Topics: Iran, Iraq | Winter 2014 MEQ receive the latest by email: subscribe to the free mef mailing list This text may be reposted or forwarded so long as it is presented as an integral whole with complete and accurate information provided about its author, date, place of publication, and original URL.